If you've grown sick and tired of shoveling snow time and time again through the long winter months, perhaps it's time to consider the next best thing to a driveway that shovels itself. Though winter’s worst storms are likely yet to come, many homeowners around the country have already had ample opportunity to grow tired of shoveling snow. After all, it’s a tedious, time-consuming, back-breaking chore, one that’s regrettably unavoidable in cold climates. But wait—is it truly unavoidable? No. There is another way, thanks to an innovative snow-melting system that enables equipped driveways and walkways to automatically melt away accumulated snow on their surfaces. Manufactured by SunTouch, the ProMelt line of heating cables and mats operates similarly to radiant-heat flooring installations. The system heats from below, and because it’s specially designed for use outdoors, the electric heat works to melt away not only powdery snow, but also stubborn ice. The cables “are generally activated by special snow sensors,” says Daniel O’Brian, a technical expert from online retailer SupplyHouse.com. That means, once the snow begins to stick, the system can automatically click on. You don’t have to think about it if you don’t want to, but “manual controls are often an option as well,” O’Brian confirms. 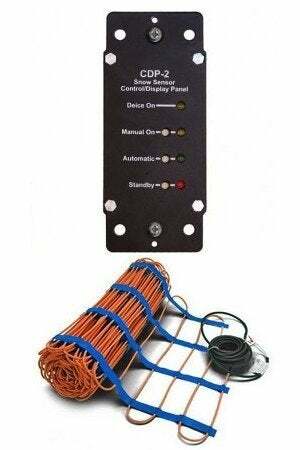 Manual control can you help you minimize the operating cost of a heated driveway and/or walkway. It’s difficult to estimate the seasonal expense involved, because, as O’Brian points out, “electricity rates and the severity of winter storms change from location to location.” In addition to the cost of operation, there’s also the initial investment to cover the components and their installation. O’Brian notes that snow-melting systems are ideal for new home construction, or for homeowners who plan to install a new driveway or walkway. “Retrofitting them is virtually impossible, unfortunately,” because the mats must run under or within the paving. ProMelt snow-melting mats range in size from 2′ x 5′ to 2′ x 56′; prices start at $190. Customizable configurations allow them to be used with the majority of today’s popular driveway and walkway materials—concrete, asphalt, pavers, and tile among them. Installation methods differ somewhat from material to material. Beneath pavers and stone, for instance, the mats are set into the substrate sand. In concrete, the mats are affixed to wire or rebar that’s suspended into the middle of the pour. ProMelt mats rely on oxygen-free copper heating elements and are made to be flexible and long lasting. Thermoplastic insulation guards against corrosion and temperature resistance, while a tough polyurethane outer jacket adds further protection against chemicals and abrasion. Though the mat configuration facilitates installation, in certain outdoor configurations it may be preferable to use “loose” heating cables, as these can be worked around bends and other such obstacles. Both types are available through SupplyHouse.com, and both can be handled by contractors or ambitious DIYers.